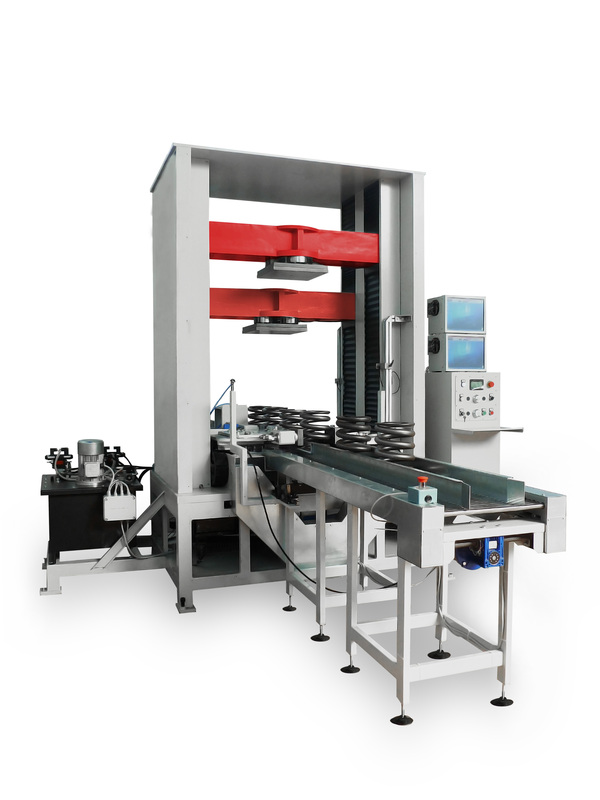 AURA TWINS is an automatic system for pressing and measuring springs, equipped with a motor-driven roller conveyor at inlet and outlet, as well as an automatic paint marking system. AURA TWINS is equipped with a presetting station and a spring testing station. After measurement, the springs are divided into 5 classes thanks to a spray-marking system with 5 colours depending on the set tolerances, so as to avoid a sorting system with several channels. In this model, two spring testers work simultaneously to save time. The first spring tester settles the springs with a programmable number of pressing operations, while the second performs the test cycle of a classic spring tester. The springs are conveyed by hydraulic grippers and it is really simple to change the family of springs to be tested. To perform a test, the user need only enter the few necessary parameters and press the GO button. A complete test cycle lasts only 15-19”. The three load cells are fitted at 120°, with reading at 1,000 Hz and 32,700 divisions. The cells are protected against overload and with the release of the automatic axis in the event of out of scale values or of unforeseen impact and they have integrated compensation of cell sagging. The system is controlled by a PLC and by a computer with touch screen and software entirely developed by Easydur and based on Windows with internal management of archives, statistics and certificates in Excel format, totally modular and customisable by the customer.